Ammonium acetate (CH3COONH4) is a white crystalline solid, water soluble compound derived from the chemical reaction ammonia and acetic acid. Being a salt of weak base and weak acid, it possesses several distinct applications like, it is used as an aqueous buffer for High-Performance Liquid Chromatography (HPLC) with Evaporative Light Scattering Detector (ELSD) and Electrospray Ionization Mass Spectrometry (ESI-MS) of proteins [1,2]. It is also used as a food additive to regulate the acidity. Therapeutically, it is reported as an antidiuretic and antipyretic and also as a nutrient [1,3]. Ammonium acetate is also used as an intermediate and catalyst in numerous chemical reactions [1,4]. On the contrary, ammonium acetate also associated with its toxicities like flaccidity of facial muscles, generalized discomfort, tremor, anxiety, and impairment of motor performance . Ammonium chloride (NH4Cl) is also a white crystalline inorganic salt, having high solubility in water. The natural and mineralogical form of ammonium chloride is known as sal ammoniac. The ammonium chloride has wide application in the field of medicine, agriculture and in food. In medicine, it is used as an expectorant in cough syrup due to irritative effect on the bronchial mucosa. Ammonium chloride causes the nausea and vomiting effects owing to irritative effect on gastric mucosa . It is also used as a systemic acidifying agent for the treatment of severe metabolic alkalosis, and to maintain the urine at acidic pH in the treatment of urinary-tract disorders . In food products, ammonium chloride is used as an additive or feed supplement for cattle and as a nutrient for yeast and other microbes [7,8]. It is also used to improve the crispness of cookies and snacks items. In agriculture, the ammonium chloride is used as an important source of nitrogen in fertilizers . The chemical and physical stability of any chemical compound are most desired qualities that determine its shelf life and effectiveness . Hence, it is advantageous to find out an alternate approach, which could enhance the stability of compounds by altering the structural properties of these compounds. Recently, biofield treatment is reported to alter the physical, and structural properties of various living and non-living substances [11,12]. The relation between mass-energy was described by Einstein through a well-known equation E=mc2 . Planck M gave a hypothesis that energy is a property of matter or substances that neither can be created nor destroyed but can be transmitted to other substances by changing into different forms . According to Maxwell JC, every dynamic process in the human body had an electrical significance . Researchers have experimentally demonstrated the presence of electromagnetic field around the human body using medical technologies such as electromyography, electrocardiography and electroencephalogram . This electromagnetic field of the human body is known as biofield and energy associated with this field is known as biofield energy . Mr. Trivedi has the ability to harness the energy from environment or universe and can transmit into any object (living or nonliving) around this Globe. The object(s) always receive the energy and responding into useful way, this process is known as biofield treatment [11,12]. Mr. Trivedi’s unique biofield treatment is also called as The Trivedi Effect®, and known to alter the characteristics of many things in the verities of research fields including microbiology [11,18], agriculture [19,20], and biotechnology [21,22]. Recently, impact of biofield treatment on atomic, crystalline and powder characteristics as well as spectroscopic characters of different materials were studied and alteration in physical, thermal and chemical properties were reported [12,23,24]. Considering the effects of biofield treatment on various living and nonliving things, the study was aimed to evaluate the impact of biofield treatment on spectral properties of ammonium acetate and ammonium chloride. The effects were analyzed using Fourier Transform Infrared (FT-IR) and Ultraviolet-Visible (UV-Vis) spectroscopic techniques. The ammonium acetate and ammonium chloride were procured from Sigma-Aldrich, India. Each compound was divided into two parts and coded as control and treatment. The control samples were remained as untreated, and treatment samples were handed over in sealed pack to Mr. Trivedi for biofield treatment under laboratory conditions. Mr. Trivedi provided this treatment through his energy transmission process to the treatment groups without touching the samples. The control and treated samples of ammonium acetate and ammonium chloride were evaluated using FT-IR and UV-Vis spectroscopic techniques. For FT-IR analysis of control and treated samples of ammonium acetate and ammonium chloride, the samples were crushed into fine powder. Consequently, the crushed powder was mixed in spectroscopic grade KBr in an agate mortar and pressed into pellets with a hydraulic press. FT-IR spectra of were acquired on Shimadzu’s Fourier transform infrared spectrometer (Japan) with frequency range of 500-4000 cm-1 and a maximum resolution of 0.5 cm-1. The analysis were carried out to evaluate the impact of biofield treatment at atomic level such as force constant, dipole moment, and bond strength in chemical structure . 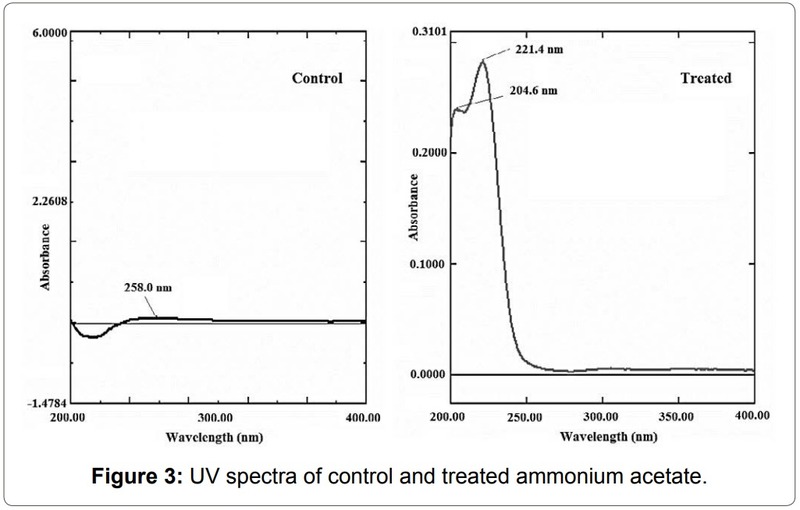 UV spectra of control and treated ammonium acetate and ammonium chloride were acquired on Shimadzu UV-2400 PC series spectrophotometer with 1 cm quartz cell and a slit width of 2.0 nm. The study was carried out using wavelength in the range of 200-400 nm. The UV spectral analysis was performed to determine the effect of biofield treatment on the energy gap between bonding (π-π*) and nonbonding (n-π*) electrons transition . 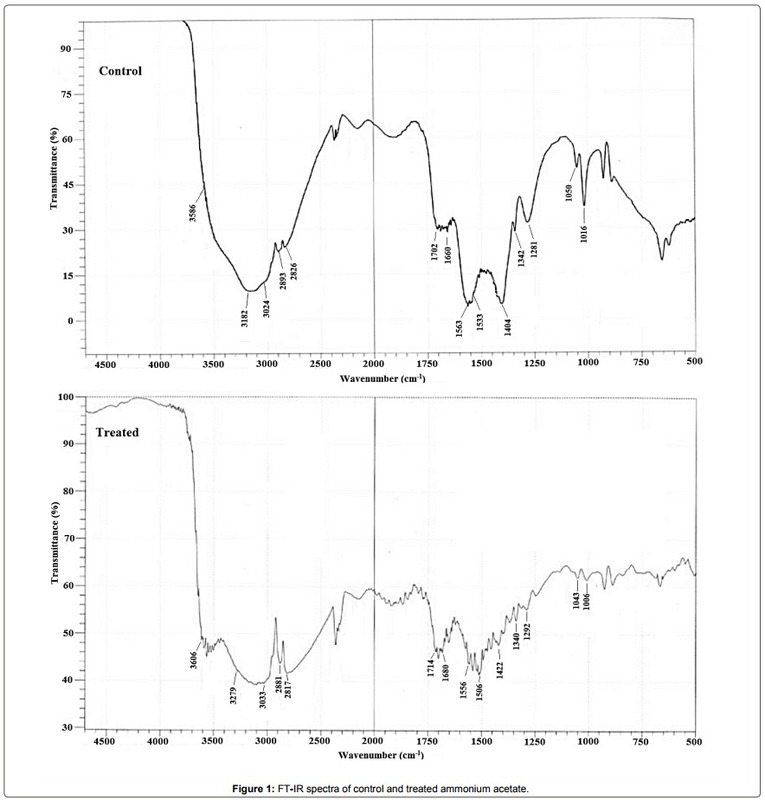 The FT-IR spectra of control and treated ammonium acetate are shown in Figure 1 and the IR spectral interpretation results are reported in Table 1. 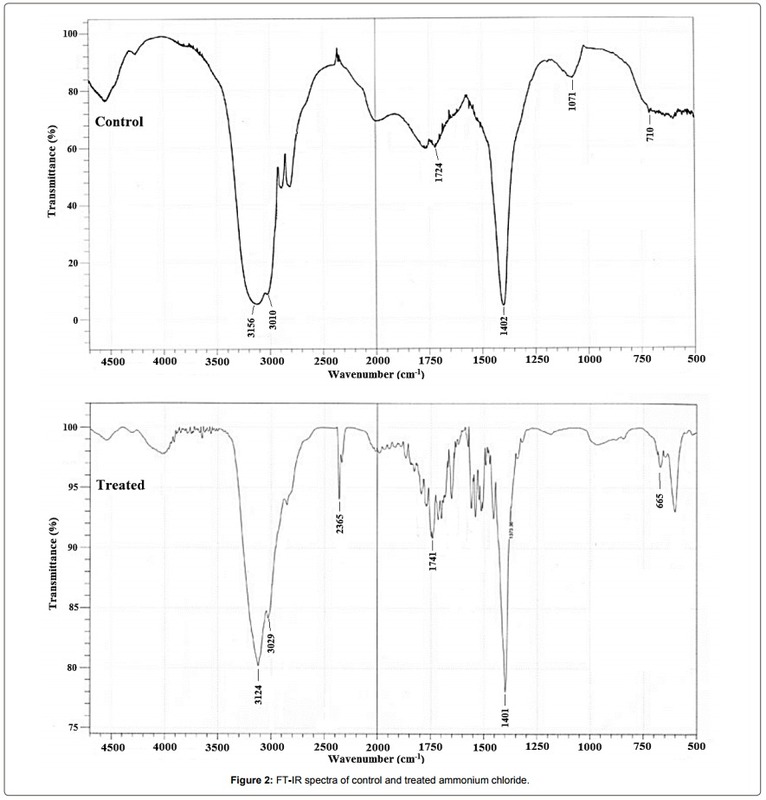 The FT-IR spectrum of control ammonium acetate (Figure 1a) showed the IR peaks at 3024-3586 cm-1 for N-H stretching of NH4 group. These peaks were shifted to higher frequency region i.e., at 3033-3606 cm-1 in treated sample (Figure 1b), which indicated an enhanced force constant of N-H bond as compared to control. IR frequency (ν) of stretching vibrational peak depends on two factors i.e., force constant (k) and reduced mass (μ) which can be explained by following equation . If μ is constant, then the frequency is directly proportional to the force constant; hence, alteration (increase or decrease) in frequency of any bond indicates a respective change in force constant . The C-H stretching’s were appeared at 2826-2893 cm-1 in control sample that were shifted to lower wavenumber in treated sample i.e., at 2817-2881 cm-1. The C=O asymmetrical stretchings were appeared at 1660-1702 cm-1 in control sample, which were shifted to higher wavenumber in treated sample i.e., at 1680-1714 cm-1. This could be due to increased bond strength of C=O bond in treated sample as compared to control. N-H bending was assigned to peaks at 1533-1563 cm-1 in control sample of ammonium acetate that were observed at 1506-1556 cm-1 in treated sample. It depicted a reduced torsion force of N-H bending after biofield treatment as compared to control. The C=O symmetrical stretching was assigned to peak at 1404 cm-1 in control sample, which was observed at higher wavenumber i.e., at 1422 cm-1 in treated sample as compared to control. This shifting of C=O bond to higher frequency region was occurred possibly due to increased force constant of C=O bond. The C-H deformation bends were assigned to the peaks at 1281-1342 cm-1 in control and 1292-1340 cm-1 in treated sample of ammonium acetate. Likewise, the C-O stretching peaks were observed at 1016-1050 cm-1 in control sample, which were slightly shifted to lower frequency i.e., at 1006-1043 cm-1 in treated sample. This could be due to reduced force constant of C-O bond after biofield treatment as compared to control. Overall, the FT-IR results of ammonium acetate suggest a significant impact of biofield treatment at the atomic level i.e., at dipole moment and force constant of respective bonds. The FT-IR data of control ammonium acetate was well supported by the literature . chemical stability of treated compounds might also be alter. Based on this, it is speculated that biofield treatment could be used to increase the chemical stability of any compound, which might be more useful than the untreated compound. which causes the shifting of wavelength (λmax) in treated sample with respect to control. 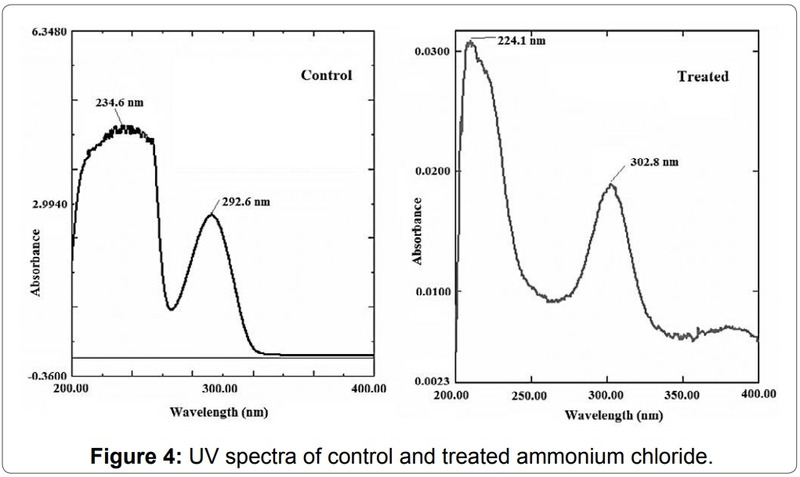 The UV spectra of control and treated ammonium chloride are shown in Figure 4. The control sample (Figure 4a) exhibited the absorbance maxima (λmax) at 234.6 nm and 292.6 nm. Whereas, the biofield treated ammonium chloride exhibited the absorbance maxima (λmax) at 224.1 and 302.8 nm (Figure 4b). This slight shifting of λmax after biofield treatment also suggest a possible alteration in energy gap between σ-σ*, π-π* or n-π* transition in ammonium chloride molecule with respect to control. Altogether, the UV spectral data of both the ammonium acetate and ammonium chloride (control and treated) revealed a considerable impact of biofield treatment on the atomic level of respective compound. Table 1: FT-IR vibrational peaks observed in ammonium acetate. Table 2: FT-IR vibrational peaks observed in ammonium chloride. ammonium chloride showed the alteration in wavenumber of IR peaks assigned to three (ν1, ν2, and ν3) out of four distinct internal oscillations of NH4 group as well as N-Cl stretching with respect of control. UV spectra of ammonium acetate and ammonium chloride showed the alteration in absorption maxima (λmax) after biofield treatment as compared to respective control. Altogether, the FT-IR results suggest an impact of biofield treatment on atomic level like dipole moment, force constant, bond strength, and flexibility of treated compounds with respect to control. Likely, the UV result suggests the impact of biofield treatment on bonding and nonbonding electron transition of treated compounds with respect to control. The authors would like thank Trivedi Science™, Trivedi Master Wellness™ and Trivedi Testimonials for their consistent support during the work. Authors also like to acknowledge the whole team of MGV Pharmacy College, Nashik for providing the instrumental facility. 1. Budavari S (1989) The Merck Index: An encyclopedia of chemicals, drugs and biologicals. Merck and Co. Inc., Rahway, NJ, USA. 2. Ding L, Tan W, Zhang Y, Shen J, Zhang Z (2008) Sensitive HPLC-ESI-MS method for the determination of tiotropium in human plasma. J Chromatogr Sci 46: 445-449. 3. Rossoff IS (1974) Handbook of Veterinary Drugs: A Compendium for Research and Clinical Use. Springer Publishing Company, New York, USA. 4. Thellend A, Battioni P, Mansuy D (1994) Ammonium acetate as a very simple and efficient cocatalyst for manganese porphyrin-catalysed oxygenation of hydrocarbons by hydrogen peroxide. J Chem Soc Chem Commun 1994: 1035-1036. 5. Bothara KG (2007) Inorganic Pharmaceutical Chemistry. (9th edn) Nirali prakashan, Pragati Books Pvt. Ltd. Pune, India. 6. Mathew JT, Bio LL (2012) Injectable ammonium chloride used enterally for the treatment of persistent metabolic alkalosis in three pediatric patients. J Pediatr Pharmacol Ther 17: 98-103. 7. Oetzel GR, Olson JD, Curtis CR, Fettman MJ (1988) Ammonium chloride and ammonium sulfate for prevention of parturient paresis in dairy cows. J Dairy Sci 71: 3302-3309. 8. Costa E, Teixidó N, Usall J, Atarés E, Viñas I (2002) The effect of nitrogen and carbon sources on growth of the biocontrol agent Pantoea agglomerans strain CPA-2. Lett Appl Microbiol 35: 117-120. 9. Chesworth W (2008) Encyclopedia of soil science. Springer science & Business Media, New York, USA. 11. Trivedi MK, Patil S, Shettigar H, Bairwa K, Jana S (2015) Phenotypic and biotypic characterization of Klebsiella oxytoca: An impact of biofield treatment. J Microb Biocshem Technol 7: 203-206. 12. Trivedi MK, Patil S, Tallapragada RMR (2015) Effect of biofield treatment on the physical and thermal characteristics of aluminium powders. Ind Eng Manage 4: 151. 13. Einstein A (1905) Does the inertia of a body depend upon its energy-content? Ann Phys 18: 639-641. 14. Planck M (1903) Treatise on thermodynamics. (3rd edn) English translated by Alexander OGG, Longmans, Green, London (UK). 15. Maxwell JC (1865) A dynamical theory of the electromagnetic field. Phil Trans R Soc Lond 155: 459-512. 16. Rivera-Ruiz M, Cajavilca C, Varon J (2008) Einthoven’s string galvanometer: the first electrocardiograph. Tex Heart Inst J 35: 174-178. 17. Rubik B (2002) The biofield hypothesis: its biophysical basis and role in medicine. J Altern Complement Med 8: 703-717. 18. Trivedi MK, Patil S, Shettigar H, Gangwar M, Jana S (2015) Antimicrobial sensitivity pattern of Pseudomonas fluorescens after biofield treatment. J Infect Dis Ther 3: 222. 23. Trivedi MK, Tallapragada RR (2008) A transcendental to changing metal powder characteristics. Met Powder Rep 63: 22-28. 24. Dabhade VV, Tallapragada RR, Trivedi MK (2009) Effect of external energy on atomic, crystalline and powder characteristics of antimony and bismuth powders. Bull Mater Sci 32: 471-479. 25. Pavia DL (2001) Introduction to Spectroscopy. (3rd edn) Thomson Learning, Singapore. 26. Stuart BH (2004) Infrared spectroscopy: Fundamentals and applications analytical techniques in the sciences (AnTs). John Wiley & Sons Ltd., Chichester, UK. 27. Alias SS, Chee SM, Mohamad AA (2014) Chitosan-ammonium acetate-ethylene carbonate membrane for proton batteries. Arab J Chem http://dx.doi. org/10.1016/j.arabjc.2014.05.001. 28. Krishnan RS (1947) Raman spectrum of ammonium chloride and its variation with temperature. Proc Ind Acad Sci A 26: 432-449. 29. Max JJ, Chapados C (2013) Aqueous ammonia and ammonium chloride hydrates: Principal infrared spectra. J Mol Struct 1046: 124-135.